The Volkswagen T3 was close to go to the wrecking yard- everything was old, broken and ripped apart- not worth anything anymore. The same vehicle could be now displayed at a car show- for being one of the best restored Volkswagen T3 Campervans of his kind.... Inside and outside overhauled and of course a brand new interior, with new and redesigned furnitures from us, completed the job. The colours are all light and natural and flow with the new paint job and trimming. A typical Running Free project: The customer discovered that the Mazda E2000 van that he owned, had water and termite damage inside. Hinges and bed construction tired and all MDF was swollen up. So we started with a new 12mm plywood floor and new strong vinyl and than rebuild the layout, but replacing the old boring white with a cream and grain structured finish.We kept the lounge seat covers- as they were still in good condition. Small extras as push locks, more drawers and new curtains made the refurbishment complete. 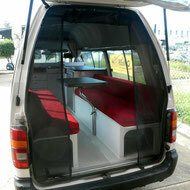 The van looked now much more modern and being more practical- even did get a sleek pull out pantry. All lights replaced with LED lightning to complete the job. This Nissan Pop Top Van was owned for many years by his first owner. The interior had a hard live so far. The interior was worn out, had water damage and was not in a good stage at all. The son had to make a decision... He did not bring the Pop Top to the wreckers- instead we refurbished the complete camper interior by keeping the main appliances as per his choice. The son spend less than $ 3,600 and the result was a Retro look like layout. A beautiful little Campervan good for the next decade. One of our rust repairs. This rust issue was discovered while a customer was in our work shop, getting a dual battery fitted and a permanent external ladder to climb up to his roof rack. As we are a one stop shop, it was a easy job for us to help here as well. This sections is the panel to hold the bonnet on a 60 series Landcruiser- of course we didn't used any putty on this job.